Even though Husband and I try to run a low waste home with careful shopping and find new reuses for what we can't recycle through our city's recycling program, there is one thing we are swimming in and loathe to regularly send to the landfill: plastic laundry and food measuring scoops. I'm most of you super low waste and plastic free folks out there are thinking to yourselves that I should just stop buying products that come with a plastic measuring scoop. It is a good suggestion and for the most part we do. However there are a few items like powdered oxygen bleach and protein powder that we don't want to give up. Green and healthy 80/20 Rule and all that. 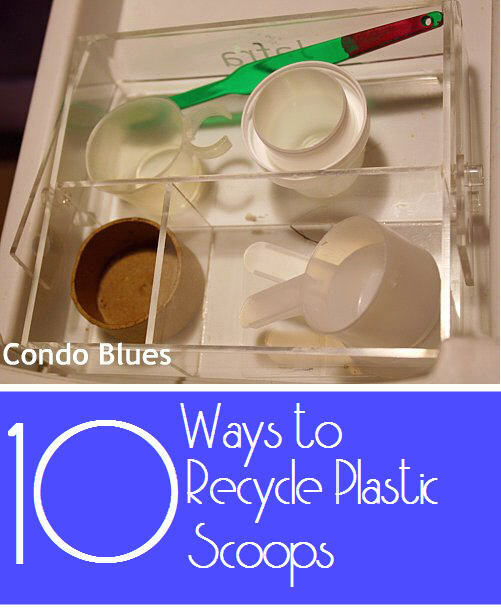 I finally had a light bulb moment on how to put our empty plastic scoops to creative reuse one day when I used a plastic laundry scoop to measure my homemade HE laundry detergent (read the recipe here on Condo Blues) while doing laundry. Hey! I bet this empty scoop army can make my life simple and more organized! How do you repurpose empty measuring scoops?